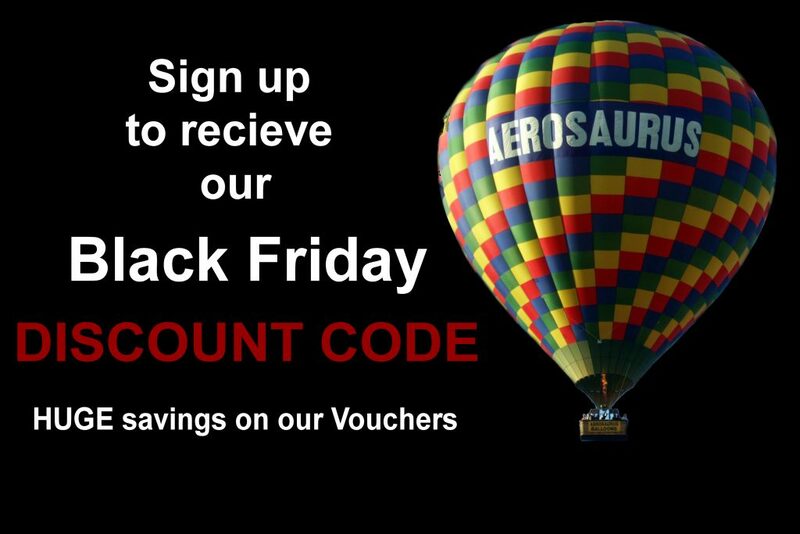 Aerosaurus Balloons Black Friday offer is back for 2017 for huge discounts on the Anytime Champagne Balloon Flight Vouchers! We are excited to announce that we are once again offering a HUGE discount on our Anytime Hot Air Balloon Flight Vouchers as part of our amazing Black Friday deal. If you are looking for the perfect gift for someone special or just a treat for yourself, a Hot Air Balloon Flight Voucher is the the answer. We fly across the South West from hand picked launch sites offering fabulous views whichever way the wind takes you. Fly from Taunton, Castle Cary, Shaftesbury, Sherborne, Salisbury, Exeter, Tiverton, Ivybridge or Launceston. If you are looking for a Balloon ride from Bristol, Bath or South Wales, visit our sister company website Bailey Balloons who are also running a Black Friday offer. To receive the code, you must register your details by 5pm on Thursday 23rd November using the form below. The discount code will be sent to you by email at 12.01am on Friday 24th November 2017 – the first 50 people to use the code will receive the discount. To receive the code, all you need to do is complete and submit the form below and we will send you the discount code to use on Black Friday! Then, simply visit the Aerosaurus website and select an Anytime Voucher to add to your shopping cart, enter your discount code and if you are one of the first 50 people to use it – your huge discount will be revealed and you can continue your purchase!